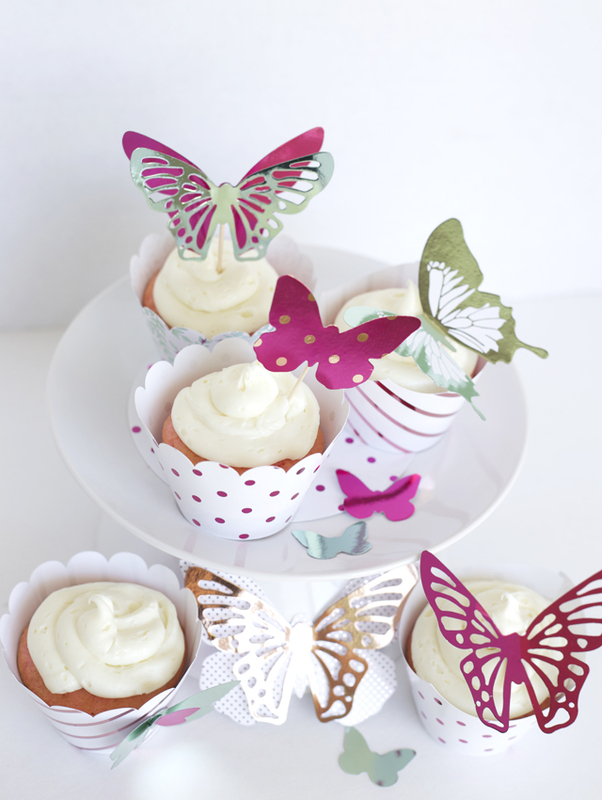 Make your own colorful Spring butterfly accents to decorate cupcakes and party decor! Okay, lovely readers of ours. I’m going to give it to you straight. I am a little obsessed with the Minc. In case you haven’t heard, you can now add beautiful colored foil to your projects – even customized printables! I recently used some of the pre-made accents created specifically for the Heidi Swapp Minc to decorate colorful Spring cupcakes! The thing I love about this machine is that it’s SO easy to use. With the pre-made shapes and accents (available along with the Minc at JoAnn, Hobby Lobby and Amazon) you can customize gifts, cards and party decor to fit your color scheme! The colors I used are mint, rose gold, pink, and hot pink. Here’s how it works: Choose your accent (or printed page if you use a laser-jet printer) and cover all the black ink with foil. Make sure it’s covered or your transfer folder will get ruined. Lay the accent in the folder face-up and lay the foil on top, also color-side up. Close the transfer folder and smooth out any bubbles. Now feed it through the machine (I like heat setting 3) and prepare to be amazed! 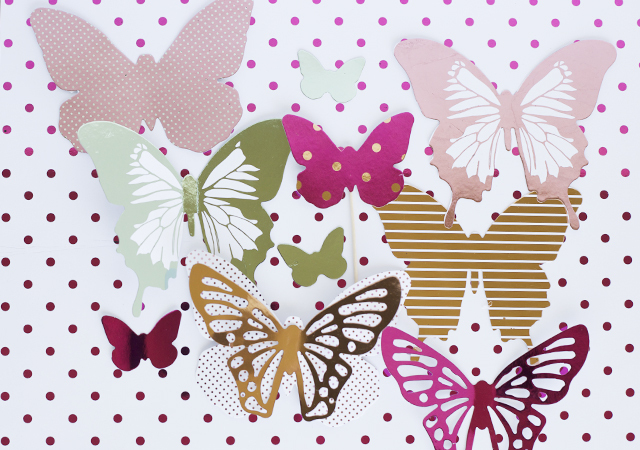 I like folding the butterflies at the center to give more of a 3-D effect! Heidi Swapp also has Minc-ready patterned paper that I just love! 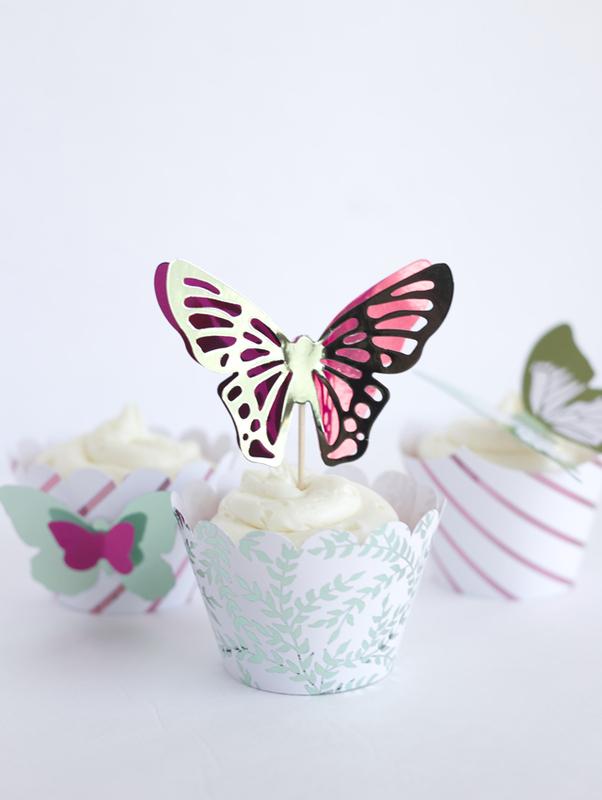 I foiled a few in matching colors and used my Cricut to cut out these cupcake wrappers. 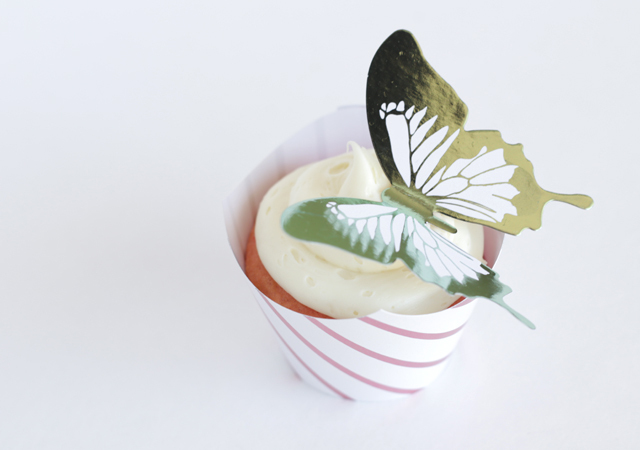 For the cupcake picks I simply hot glued the foiled butterflies to a toothpick. I had fun trying some reverse techniques on the butterflies. Here’s how to use the leftover foil on other accents. Butterfly 1 below came in the pack as black and white stripe. You can see what it looked like after adding the rose gold foil. 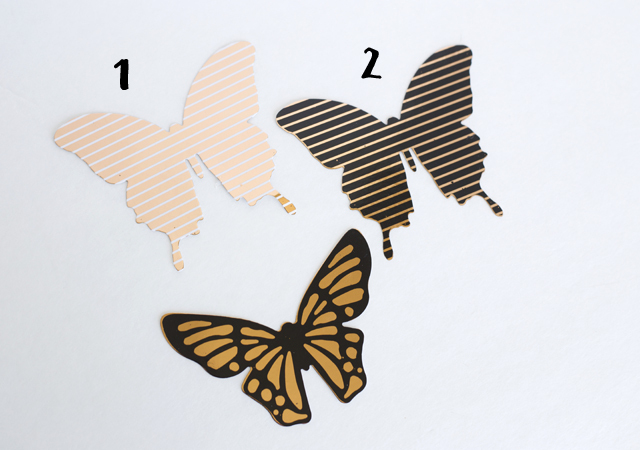 After foiling that butterfly, I took the leftover piece of foil and added it to an all-black butterfly (#2) that was the same size and shape and ran it through the Minc. 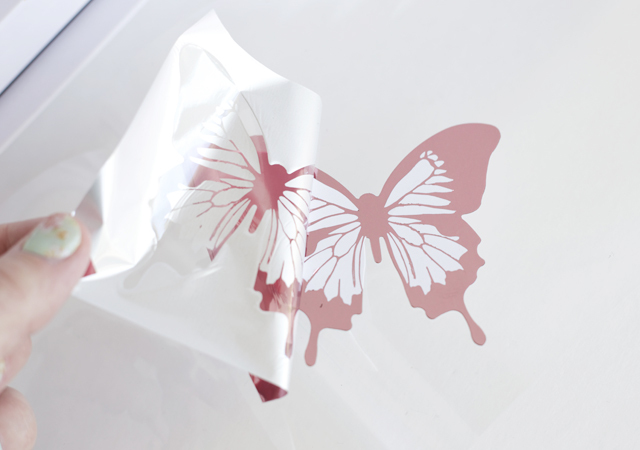 After this pass, you could even add another piece of foil because there was still remaining toner on the butterfly. I used the same technique for these two butterflies, and I love the result! 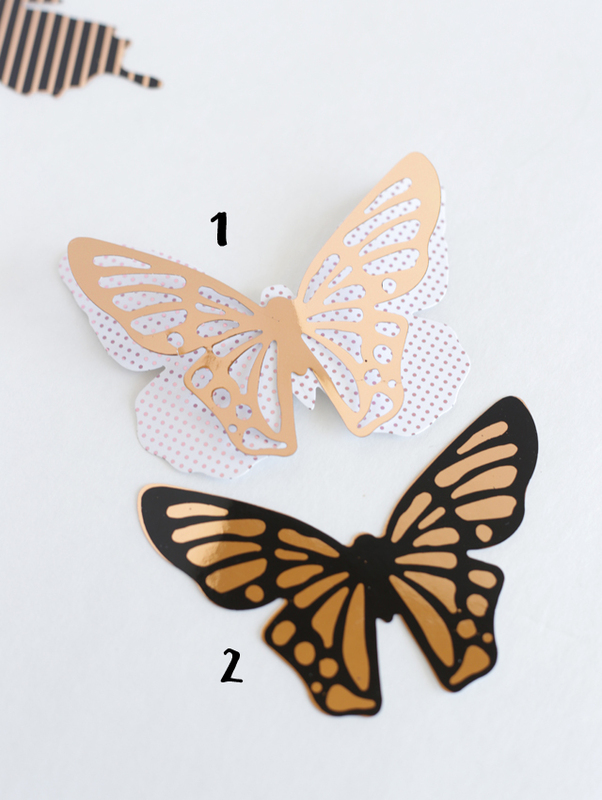 I added the foil to the die-cut butterfly (#1) and used the reverse to add the remaining pattern to a black butterfly. There are so many fun ways to use this technique and mix colors of foil, also. 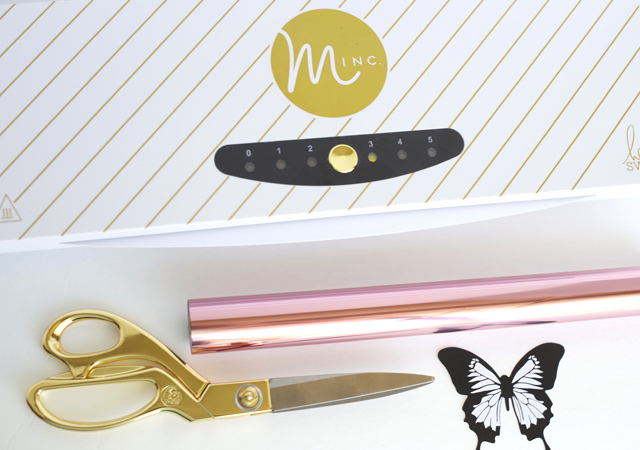 I love how easy it is to make custom party decorations and gifts using the Minc. Stay tuned for a fun 4th of July Minc project coming this month!